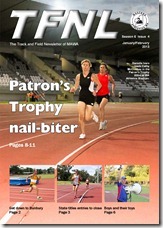 The February vetrun is now online – go to the magazines tab. City v Country Challenge will be held on 16th February 2013 at 3.00pm at Bunbury Regional Athletic Club, Hay Park, Bunbury. A javelin event has been added to the program., making 3 throws events. The program is: 60m, 100m, 400m, 1500m run or walk, medley relay, shot, discus, javelin. Come and have a great afternoon’s competition with our fellow Bunbury athletes. Great preparation for the State T&F Championships. Competition followed by light eats Please contact Val Millard by 11 February mawasecretary@gmail.com or phone 6468 7720 if you are going, for catering/programming.